Tiger Woods reacts as he wins the Masters Tournament on Sunday in Augusta, Georgia. The victory marks his first major title since 2008 and the latest chapter in a nearly ten-year comeback. 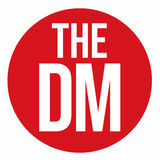 The Daily Mississippian is published Mondays, Wednesdays, Thursdays and Fridays in print during the academic year, on days when classes are scheduled. New content is published online seven days a week. Columns do not represent the official opinions of The University of Mississippi or The Daily Mississippian unless specifically indicated. The Daily Mississippian welcomes letters to the editor. Letters should be e-mailed to dmletters@olemiss.edu. Letters should be typed, double-spaced and no longer than 300 words. Letters may be edited for clarity, space or libel. Third-party letters and those bearing pseudonyms, pen names or “name withheld” will not be published. Publication is limited to one letter per individual per calendar month. Letters should include phone and email contact information so that editors can verify authenticity. Letters from students should include grade classification and major; letters from faculty and staff should include title and the college, school or department where the person is employed. Vice Chancellor for Student Affairs Brandi Hephner LaBanc interviewed last Thursday to potentially become the vice president for student affairs at the University of Utah. at the University of Utah also comes shortly after Jeffrey Vitter, the former chancellor at the University of Mississippi, said he didn’t have enough time to assemble a broad leadership team while at Ole Miss in an interview to potentially become the president of the University of South Florida. “I was brought in to be a change agent,” Vitter said. 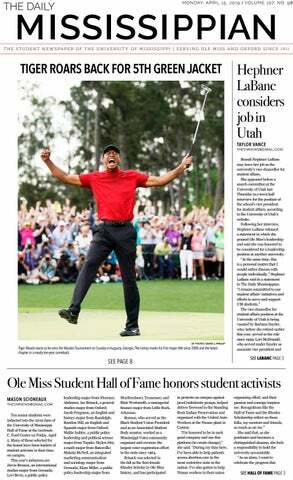 “But I made the mistake of underestimating, really, the level of entrenchment and lack of common agreement at Ole Miss.” Hephner Labanc was the first of three candidates to interview for the University of Utah job. Lori McDonald, dean of students at the University of Utah will interview on Tuesday and a third candidate who the university has yet to name, is set to interview on Thursday. A decision date has not been released by the university. ART AND FOOD VENDING – SAT. APRIL 27 | 10 A.M. - 5:30 P.M. PLEASE NOTE NO COOLERS! Friday, April 26 at 4 a.m. any cars left on N. Lamar and Monroe Ave. will be towed. Saturday, April 27 at 4 a.m. any cars left on the Square, N. Lamar, S. Lamar, Van Buren, E. Jackson and any City of Oxford or county parking lot will be towed. **Double Decker Arts Festival and City of Oxford are not responsible for any towing fees. SUN-WED 10:30 AM-2 AM OPEN LATE! THURS-SAT 10:30 AM-3 AM Register for Intramural Sports! Register at IMLeagues.com/OleMiss or on the REC*IT app. Thanks for Another Great Semester of Intramural Sports! in the Vicksburg area. No injuries were reported there, but officials said several businesses and vehicles were damaged. Trees were down throughout the hilly city on a bluff overlooking the Mississippi River. The roof of a hotel in New Albany was damaged, but the cause was unclear. Mississippi State University’s 21,000 students huddled in basements and hallways as a tornado came near the school’s campus in Starkville. Mississippi State University spokesman Sid Salter said some debris, possibly carried by the tornado, was found on campus, but no building damage or injuries were reported. Trees were down, and at least some minor damage was reported in residential areas east of the campus. Need to get it sold? Looking for a home? while others were treated at M the scene for minor injuries, T Yezak said. Some people had to be extricated from their homes. Downed trees and damage to buildings and a transmission tower were reported, said meteorologist Monique Sellers. Winds of up to 60 mph were reported in Cherokee County, Texas, damaging two homes in Alto, about 140 miles north of Houston, but no injuries were reported. The forecast of severe weather forced officials at the Masters in Augusta, Georgia, to begin the tournament early Sunday, starting threesomes off the first and 10th tees on the day’s final round in hopes of finishing in mid-afternoon before the winds and rains began. Need to get it rented? Looking for a rental? Need to get a job? Looking for an employee? Oxford/University Stadium For Sons, Dads, Grandfathers, Brothers, and Uncles! Place your ad here! Look here for an ad! Mississippi MUTTS will introduce its new event, Yappy Hour, tonight from 4 to 6 p.m. in Cabin 82 of The Graduate Oxford. Tonight and the third Monday of every month going forward, there is an open invitation to all dog lovers within the Oxford community. Mississippi MUTTS facilitates the homing of animals in Mississippi with the goal of alleviating animal overpopulation in shelters. A portion of proceeds collected at Yappy Hour will benefit the charity, and those donations will be put toward foster animals’ medical emergencies and supplies that foster homes need to care for the animals. Emma Heasley, the charity’s developmental director, said she’s excited to see the fellowship of the Oxford community at the event. Mississippi MUTTS will host their new monthly event, “Yappy Hour,” tonight at The Graduate, where dog lovers can come together for appetizers and cocktails. With Performance Checking earn 4.00% APY on your money up to $40,000 when qualifications are met. To avoid a service charge, you must maintain a minimum average daily balance of $4,000. Visit Origin Bank today. (1) Annual Percentage Yield (APY) effective as of 02/05/2019. After qualifications are met, 4.00% APY on balances up to $40,000; for balances above $40,000, APY ranges from 4.00%-0.40 APY depending on the balance of the account. Fees may reduce earnings. (2) You must have 16 posted (POS or signature based, not ATM) debit card transactions per qualification cycle, make 1 ACH debit or credit per qualification cycle, and receive a monthly eStatement on this account or the APY paid on your entire balance will be 0.00%. These monthly requirements must be completed 3 days prior to the end of your statement cycle. Rate may change on or after June 30, 2020. A service charge of $14 will be imposed every statement cycle that the average daily balance falls below $4,000. Limited to one account per individual. Closing this account within 90 days of opening results in $25 fee. If you originate a mortgage loan with Origin during the life of this account you will receive a $100 lender credit to be redeemed at the time of your closing; there is no minimum balance required for this benefit. 8 runs and collected 14 hits during the win on Friday. Six of the runs and nine of the hits came against right-handed starter Jimmy Ramsey. Sunday was another story. The left-handed Mason Hazelwood and Zack Thompson both stifled the Ole Miss offense. Hazelwood pitched 5.2 innings of a shortened seveninning game. He surrendered 5 hits but kept the Rebels from scoring. Thompson is the ace of the Kentucky staff, and he is regarded as one of the finest left-handed starters in the country. The lefty’s curveball kept Rebel hitters off balance at the plate, especially when he got ahead in the count. He received some luck from the wind as two well-hit balls to left field that usually leave the park were held up at the warning track. The likely top-15 pick faced the possibility of Ole Miss taking the lead three times. NOW HIRING DRIVERS at BOTH Oxford locations! Make $12-$18 an hour! runs. Four of the hits against him were extra-base hits, two doubles and two home runs. Nikhazy’s emergence as the second starter behind Will Ethridge has, in a sense, saved the season for the Ole Miss baseball team. After him, it has been a revolving door of bodies that cannot lock down spots as starters. In a weekend where he looked vulnerable, Ole Miss lost a series. Third Base: Grae Kessinger’s hot streak continues The offense did not produce many bright spots on a cloudy Sunday. However, Grae Kessinger’s bat is becoming just as valuable, if not more valuable, than his glove. The junior leaves the weekend with a 25-game on-base streak. He went 7-10 at the plate over the weekend while walking once and getting hit by a pitch. His solo home run on Friday was one of his 4 RBIs for the series. His batting average has risen to .342, closing the gap on Thomas Dillard for secondbest average. Puzzles by KrazyDad HOW TO PLAY Complete the grid so that every row, column and 3x3 box contains the numbers 1 through 9 with no repeats. Crossword puzzle provided by BestCrosswords.com (www.bestcrosswords.com). Used with permission. Autumn Gillespie throws the ball to a teammate during the series against Florida earlier this season. The Rebels won the first two games against Missouri this weekend but lost the final game. three 2-5 to lose the sweep. Ole Miss took the lead first by loading the bases from singles by Alvarez and Roth and a walk from Becker, but a 5-run fourth inning for the Tigers was too much for the Rebels to come back from. Pinch runner Kacey Hvitved was able to run home on a wild pitch, but Ole Miss left its other runners stranded. Latham drew 3 walks and walked in a run in the sixth inning to drop the Tigers’ lead to three, but Ole Miss failed to capitalize on the situation again and stranded the runners. Ole Miss left 12 runners on base, tied for the most in a game this season. The Rebels were also able to draw 11 walks, the most in a game since 2017. With this series win, Ole Miss now has four series wins this year, a program record. The Rebels still have three series left in the regular season and will travel to Starkville next weekend to take on Mississippi State. Before Ole Miss faces the Bulldogs, the team will have a midweek matchup against UT Martin at 6 p.m. Tuesday in Oxford. 662.281.0438 If you have been charged with a criminal offense call our office to schedule a free consultation regarding the criminal charges which have been brought against you. Weekend and after-hours appointments available for legal emergencies. the casual fan back. This may not bring golf back to where it was, as the sport’s prime and Tiger’s prime are directly related, but that doesn’t matter right now. This may not repair his legacy in the eyes of those who condemn him for his actions off the course, but that doesn’t matter right now. Today, we have this, a man taking his second chance and giving us the greatest comeback story in sports history and the ability to truly say this: Tiger is back.